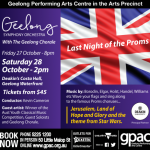 The Last Night Of The Proms Geelong Symphony Orchestra and guests. Costa Hall October 27, 2017. 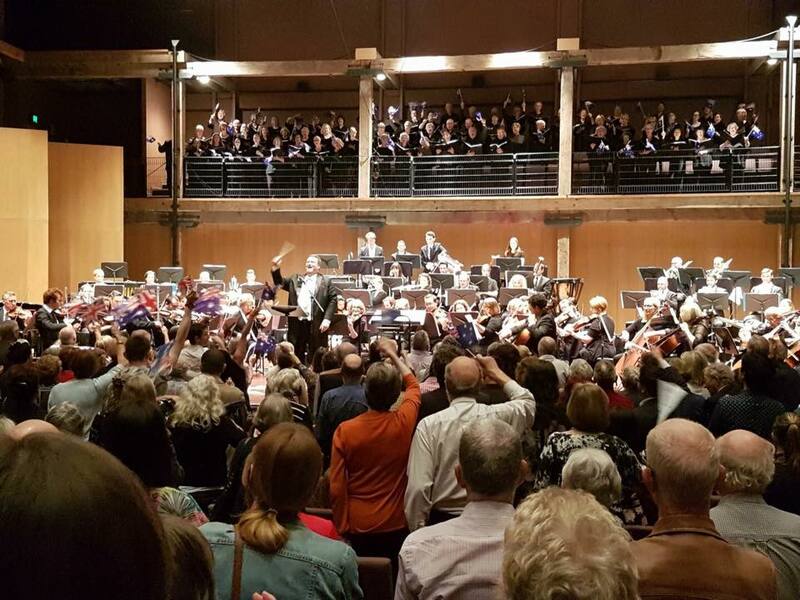 There was an expectant atmosphere before the first (Friday night) ‘final’ concert in the series delivered during this year by Geelong Symphony Orchestra. We are fortunate to have such an accomplished group of players in this city, and they certainly gave good reason for continued regional pride, performing a lively set of popular classics with verve and great skill. 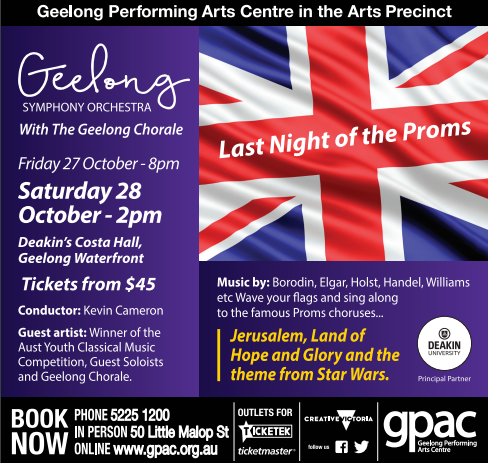 The Last Night of the Proms is typically fun-filled and a little silly, perhaps beyond the comfort zone of most of Geelong’s concert-going audience. Our compere Colin Mockett appeared at first in costume, cape and helmet, and announced that we were to hear ‘a selection of Darth Vader’s greatest hits’, which helped to set the tone of the evening as the first item was from the Star Wars Suite by John Williams. His masterful and dynamic orchestration was excitingly reproduced by our orchestra, conducted with verve by Dr. Kevin Cameron, and the standard of performance was set at a very high level. Some of the history and popularity of the Prom series (originally ‘promenade’ concerts, held in parks in London) was outlined, before the introduction of 24-year-old Riley Skevington, recent national winner of the Australian Youth Classical Music prize. He played the 3rd movement of Brahms’ Concerto in D, written in 1878 at about the time of the earliest Proms and regarded as one of the greatest, with all the features of virtuosic and sensitive violin playing. The Geelong Chorale, augmented to about 70 voices in the gallery and rehearsed over recent months by Allister Cox, joined the orchestra for Borodin’s Polovtsian Dances no. 17, a perennial favourite at The Proms. This exotic-sounding music, with gorgeous oboe and horn solos and plenty of percussive highlights, was a resounding success, with excellent balance achieved between choir and players. Manfred Pohlenz brought his huge bass baritone voice and theatrical gestures to one of the most familiar of all classical pieces to Geelong’s population, the Toreador’s Song from Carmen, sung mostly in French but with a cheeky gesture to football fans by the addition of a ‘Cats’ scarf and jumper, at which point Manfred encouraged all to join the singing of our team’s theme song, in English of course. After interval, William Walton’s Crown Imperial (A Coronation March) made a fine brassy fanfare with lots of percussion featured. 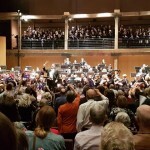 Then the audience was encouraged to sing along with the Chorale to Hubert Parry’s wartime anthem ‘Jerusalem’ (orchestrated in fine style by Sir Edward Elgar) – but while the tune is well known, the words are not and a search of the program was futile. Elgar’s own Pomp and Circumstance March, another regular feature of Proms final nights, finally prompted some (rather subdued) flag-waving, and the singing would have been joined far more enthusiastically had we access to the words. A strong rendition of Handel’s Hallelujah Chorus followed, of which many can sing various parts (not necessarily consistently or accurately!) from memory, and audience members valiantly tried to do so. The final item was an adventurous choice, an Australian work by a contemporary composer, Gavin Lockley (not yet 40 years old) which combined the singing of Dorothea McKellar’s poem ‘My Country’ over ‘Australia’ repeated by the choir. It also updated the orchestral requirements with the inclusion of guitar, bass and drum kit, and on first hearing was stirring but a little confusing. It is to be hoped that further performances will make such modern works better known. However, applause for the performers was long and very enthusiastic and after some hesitation resulted in an encore of Elgar’s March in its entireity, which should have been expected and could probably have been abbreviated. Geelong Symphony Orchestra and The Geelong Chorale are to be congratulated for the standard of music-making throughout. On Friday evening the audience participated only timidly, but I have heard that children in particular enjoyed Saturday afternoon’s repeat concert. Despite the intention of the programming and levity of our compere, it seemed Geelong is not quite ready to make light of beloved classics, but certainly appreciates the quality of music-making in our city.